Is there a parent out there that hasn’t dealt with their child being a picky eater at one point? My three-year-old daughter, Ava’s eating habits are constantly evolving and changing. She has went through stages of not wanting to eat anything, to eating everything insight and then refusing certain foods that don’t look a certain way. As a parent, I’m constantly trying to find new combinations of foods and snacks that are not only appealing to her, but healthy too. This is obviously easier said then done! There is only so much I can do to combat her picky eating at times. I have come up with certain tricks to get my daughter to eat a well balanced and nutritious diet. Ava hates having to chew too much and that can be a problem when it comes to eating vegetables and meat. To promote eating vegetables at snack time I don’t serve them to her chopped, but shredded. When I shred her carrots (her favourite vegetable) she eats them up like sugar-filled cookies! Similarly, this technique of making her food smaller is great for disguising meats in her dinners. Picky eaters like more daughter are notorious for missing out on key nutrition, so I make sure she gets a vitamin supplement each morning. After trying a lot of products, we finally settled on IronKids Gummy Vitamins from Life Science Nutritionals. 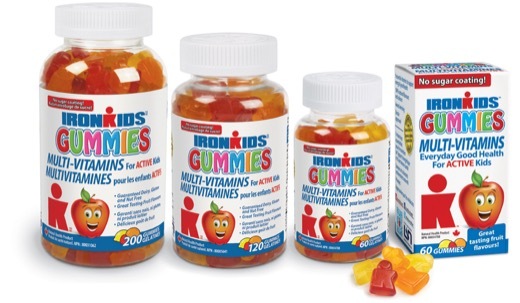 IronKids Gummy Vitamins are made in Canada and offer a variety of doctor reccomended vitamin supplements specially formulated to support the nutritional needs of kids. The gummies are made with real ingredients while being free from a sugar coating, aspartame, and artificial colors. 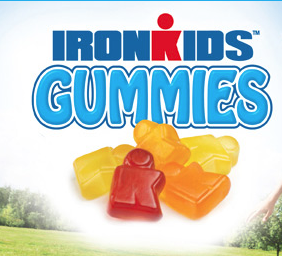 All IronKids Gummies are also made in a nut free facility, and are dairy and gluten free. With Iron Kids Gummies, I’m confident my daughter’s nutritional needs are being met, so she can get the most out of her active day. At the moments, Ava is taking the IronKids Multi-Vitamin Gummies. The gummies taste great and are super easy to chew unlike solid vitamin based supplements. It feels great that I never have to deal with a picky eater when it comes to Ava taking her vitamins. To be honest, she actually begs for more! IronKids Fibre Gummies: For children between the ages 6-13 these vitamins are a source of dietary fibre for the maintenance of a healthy digestive system. Extracted from 100% all natural chicory root, they have been specifically formulated to help kids maintain a balanced diet. IronKidsOmega-3 Gummies: Specially formulated with pure source DHA and EPA, essential fatty acids that are needed for the optimum development of a child’s brain and nervous system and supporting a healthy cardiovascular system. IronKids Vitamin D Gummies: Are Canada’s first gummy Vitamin D product specifically designed for kids and each gummy contains 400 IU’s of Vitamin D.
IronKids Calcium Gummies: Are enhanced with Vitamin D and contain 200 mg of calcium per serving. The calcium is sourced from non-dairy sources, which make it perfect for children that may have diary allergies or be lactose intolerant. IronKids Omega Bursts: Made from highly concentrated ultra pure source fish oil. They supply DHA and EPA, essential fatty acids that are needed for the optimum development of a child’s brain and nervous system and support a healthy cardiovascular system. Be sure to visit the Life Science Nutritionals website where you can learn more about the IronKids line of vitamins and where you can purchase their products with exclusive coupons. Celeb Baby Laundry is giving (1) lucky reader (1) bottle of IronKids Gummies! Rules: Participants may enter across many blogs at they wish, but may only win on a single blog. This giveaway is open to residents of Canada. The winner will need to provide their shipping information in order to receive the prize.